I have a guide dog who thinks she is still a little puppy, but has the responsibility of keeping me safe. At the same time, I have a mother with dementia who thinks she still has responsibility for my care, but whose behavior is often reminiscent of that of a petulant toddler. In one sector of my life, I am amused by the playful antics of a 60-pound puppy, which has 2 passions in life. One is to dive into her harness and get out the door for another adventure. The other is to retrieve a ball that I’ve tossed across the room or across the yard and dash back to me, drop it in my lap and pant excitedly until I throw it again, for the 50th time. It’s ironic to think that I trust this creature to guide me across busy streets, this creature, who thinks her second job is to bring that ball back to me as fast as she can. In another sector of my life, I deal with a 98-year-old mother who worries if I don’t call her every day. She thinks I’ve fallen in a hole or something. Some days, she seems to have not noticed that I have forgotten to call her the day before. At those times, her imagination creates some important meeting that I had to attend or a trip overseas. Her pride in my achievements, whether real or imagined, is embarrassing and touching at the same time. When we have lunch together, she picks up my napkin and hands it to me, as if I am unable to find it myself, or perhaps it’s her old habit of reminding me to put it in my lap. Once a mother who teaches, always a mother who teaches I guess. Once a mother who cared for her visually impaired little girl, always a mother who wants to protect her blind daughter, even though she, herself, is now blind, extdremely hard of hearing, and mobility-impaired. She hasn’t noticed the role reversal. She is a resident of assisted living, and is well cared for, but like anyone living in a community situation, she needs an advocate and a connection with the outside world. Although my son visits her occasionally, and my daughter flies in twice a year to visit her and give me a break, I am the one who does her laundry, pays her bills, makes her doctors’ appointments, brings her home baked goodies, keeps her supplied with personal hygiene products, and tries to entertain her twice a week. I am the one who gets drawn into arguments about whether or not the aids are stealing her shoes and eating her food from her fridge. Arguing with a 2-year-old is never productive, but somehow, when you’re the mother of the 2-year-old, it isn’t as stressful and frustrating as when you’re the daughter of a 2-year-old. When you’re the mother, in the end, you can pick up the child from the floor, where she’s throwing a tantrum, and put her in the car or her high chair or wherever you need her to be. But when you’re dealing with your mother, you try to maintain her dignity and your respect for her as your parent. “Honor thy mother and thy father” gets a little challenging when your mother says things that don’t make any sense, and she gets snippy when you don’t understand. 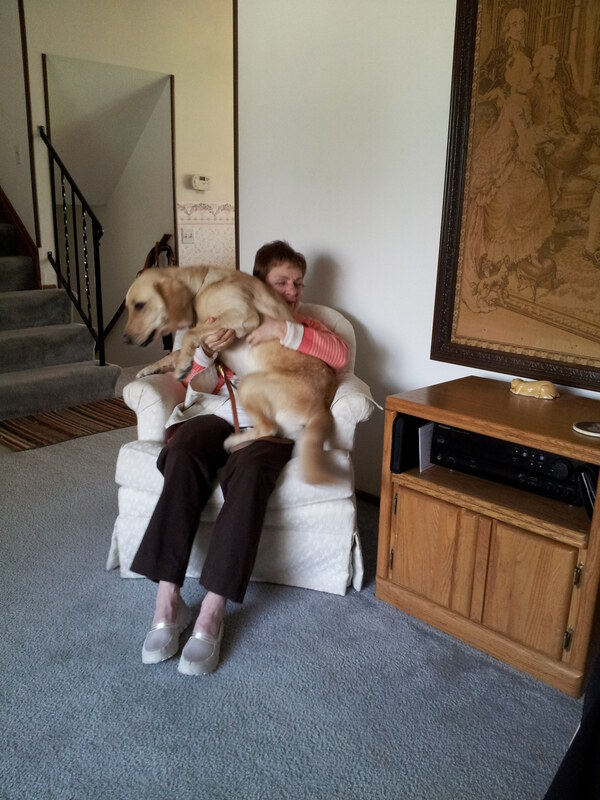 After a visit with my mother, it’s comforting to be guided into my house by my Seeing Eye ® dog, and then let her curl up in my lap. Well “in” might not be the right word. This post is accompanied by a photo of Dora trying to sit on me in my living room chair. My life is full of ironic role reversals.